THE ORDER FORM FOR BLIZZCON BADGES CAN BE FOUND BOTH ON THE ORDERING PROCESS PAGE AND RIGHT HERE, ON THIS HYPERLINK! What exactly is a Blizzcon Badge? 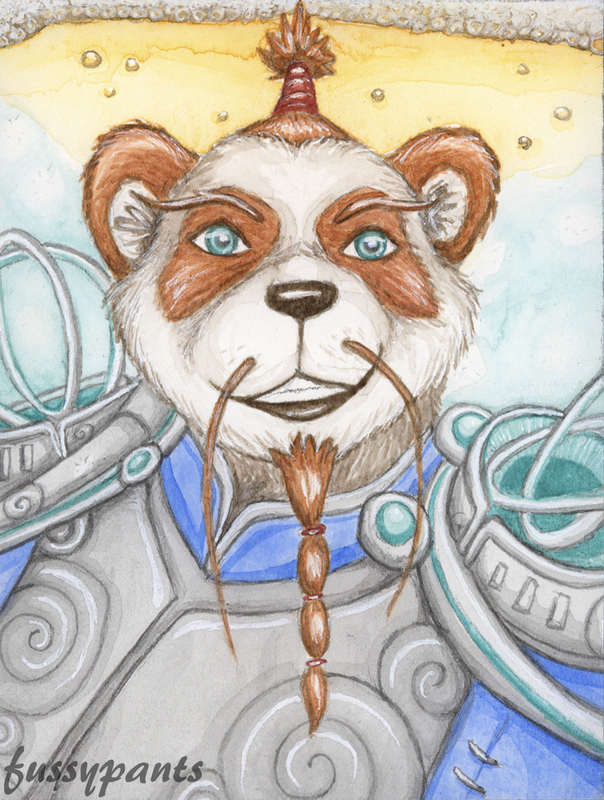 Badges are small, artist created portraits that people wear to conventions (in this case, Blizzcon). Badges act as a ‘real life avatar’ to identify yourself. The badges I make are all hand painted, primarily with watercolor. I sketch your character out, do a ‘wash’ to put down the base colors, and then add the details. 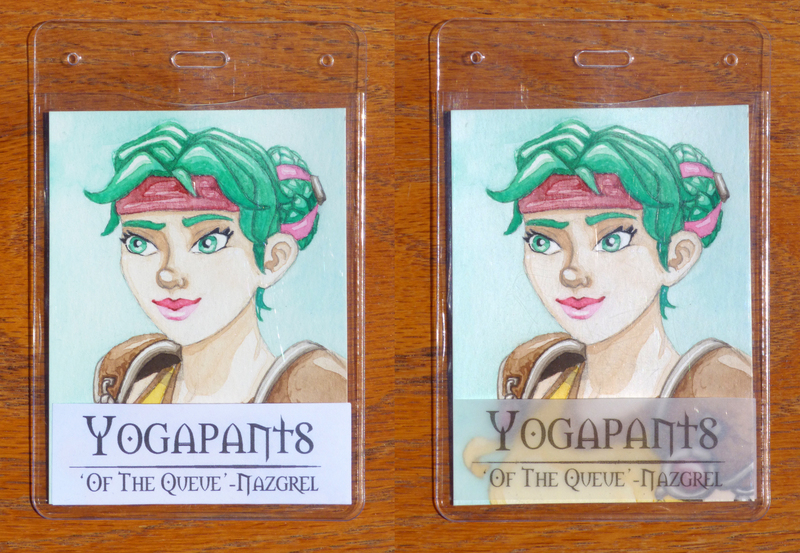 After I finish painting your character, I attach a 1″ by 3″ name tag and slide both into a plastic badge holder. I then will ship this to you before the convention. What does each Badge order include? How much can I customize my badge? Please provide a link to a reference image if the customization is very specific (an example of this would be a specific tattoo or earring). There is no additional cost for customization. What sort of Extras do you offer? And any other large additions to your character. Again, please provide a WoWhead link to the addition you want. The price for extras varies depending on complexity, but all start at $5 USD. 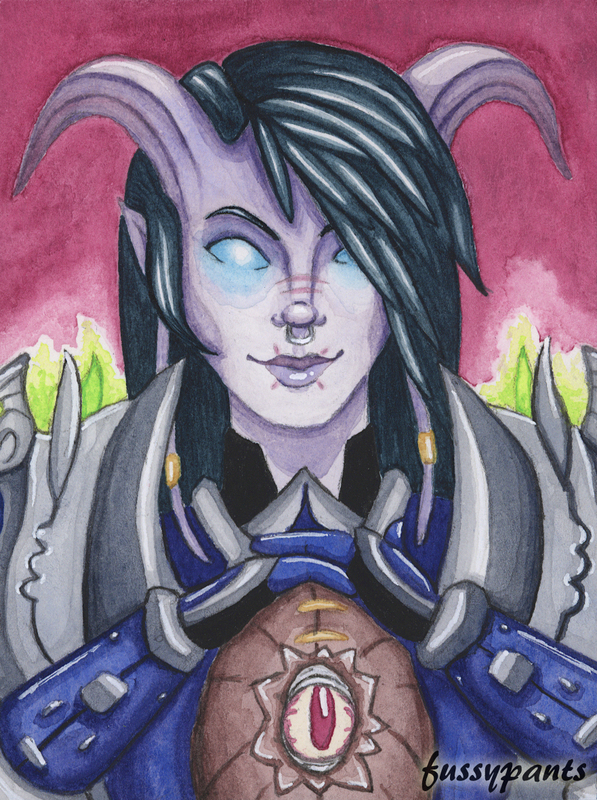 Each hand painted Blizzcon Badge costs $65 USD. The price of extras depends on complexity, but the starting price is $5 USD, to be added to the total. The cost of shipping is included in the cost of the badge. I take all my payments through Paypal without exception. As I have said before, I hand paint every character from scratch. The mediums I use are primarily watercolor and pencil, but there might be a bit of gouache and gel pen thrown in there for detail work. Because my artwork is done without a computer, my process is a bit different from many of the other Blizzcon Badge Artists. Please be aware that once I start inking, it becomes much harder to change the existing art. I do not work in Photoshop, with it’s convenient layers! Everything is semi-permanent. It takes me anywhere from 7-12 hours each badge, spread out over 2-5 weeks. The name tag is a removable, 1″ by 3″ piece of paper with two lines of text on it. The first line will contains your name. The contents of the second line are entirely up to you! Keep in mind that the longer the second line, the smaller the text will be. Some examples of what you can put on the second line are Realm and Guild, a title you are proud of, a short phrase such as For The Horde, or another name you go by. Please keep both lines of text rated PG. There are two different types of name tags I offer. Both are the same size and have the same text space. The difference between the two is the paper I print your name on. The first option is printed on Heavy White Cardstock. This name tag is the easiest to read, but it blocks part of the artwork. The second option is a name tag printed on Semi Transparent Paper. The semi transparent paper is harder to read but allows you to see all of the artwork. You can select which option you want on the order form. The badge holder is your standard ID holder (just a little bigger). The artwork and the name tag will be inserted in it for the Con. However, once Blizzcon is done, you can take your commission out of the holder and use it as your own little piece of art! I do not include any sort of lanyard. As well as email communication, I also plan to post WIPs of all the commissions on my twitter. If for whatever reason you do not want me to tweet your artwork, please let me know! Because of the time and detail put into each piece, it might take anywhere from 2 to 5 weeks for me to finish your commission. 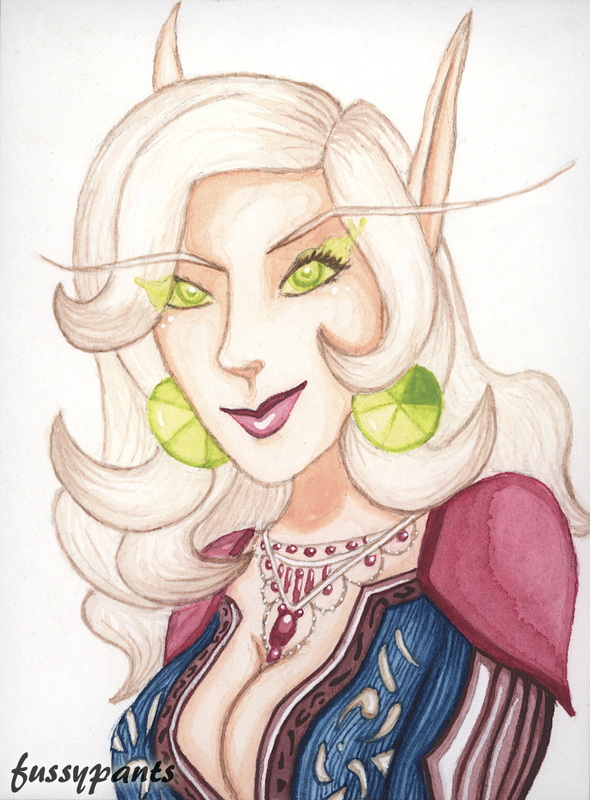 Don’t worry, the art will make it’s way to you well before Blizzcon! If you have any questions at all, absolutely email me at thefussypants(at)hotmail(dot)com. You can also reach me on twitter as @Thefussypants. Thank you for your interest and support of my work!